I know what you’re asking yourself: what the heck is banana flour. Amongst other questions, how do you make flour out of bananas, and how in the world do you use it? 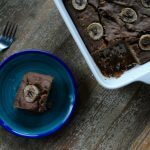 Stick with me, because I’m going to break down the facts for you, tell you why I’m using it, and share a really tasty banana flour recipe for you to try out on your own. Since going gluten-free a few years ago, I’ve been turned on to a number of non-wheat flours. Sure, my go-to for my three family members who have no sensitivities is generally whole-wheat and otherwise white whole-wheat, but if you can’t do those options, there are a multitude of others out there. I’m a big fan of brown rice flour and oat flour and often turn to Jovial’s whole grain gluten-free blend or Bob’s Red Mill gluten-free 1:1 flour when needed. And while it’s not even close to a 1:1 replacer, coconut flour is always in my pantry, too. My relatives from India first told me about banana flour and I was intrigued, probably like you. My cousin told me that they use it in cooking oftentimes but didn’t give me specific recipes (note to self: ask!). I later heard that green bananas are fine to eat while doing FODMAP, but I didn’t know how to use it. Flash forward to 5 weeks ago when I found out that I have a whole freaking host of sensitivities (UGH). I was happy to hear that bananas were on the “okay” list. And since the only ingredient in banana flour is that – green bananas – it was time to give it a try. Banana flour is flour made from milled bananas. I mentioned that my Indian relatives use it often, but it’s also been around for centuries in other parts of the world, such as South America, Africa and other parts of Southeast Asia. Banana flour can be used any time you’d use whole wheat flour – think baked goods, thickening soups, etc. It is said to be a 1:1 replacer for whole-wheat or white whole-wheat, but in all honesty, I’d have to play around with it a bit more to give you my opinion. Banana flour is rich in potassium, magnesium, fiber and vitamin E.
For those who can’t do gluten, it’s a solid option to consider. It contains resistant starch, a starch that the human stomach cannot easily digest, which is more slowly processed, and therefore supposed to be good for blood sugar control. Resistant starches are also a fuel that feeds healthy gut bacteria, which is important for digestion. It’s eco-friendly. Instead of throwing out “ugly” bananas, give them a chance! All (green) bananas can be ground into flour. 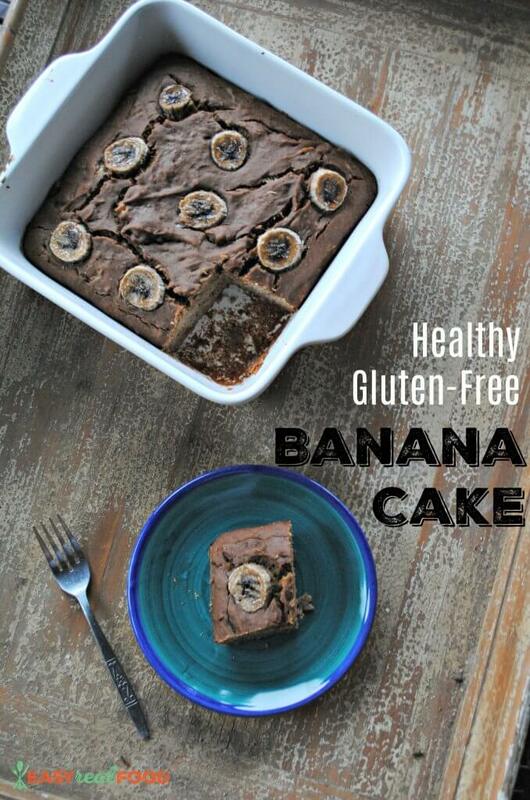 A healthy banana flour recipe that makes a gluten-free and dairy-free cake. Preheat the oven to 350 degrees Fahrenheit and grease an 8” square baker. Add the baking powder, baking soda, vanilla and cinnamon, and whisk to blend. Add banana flour, and using a big spoon, stir just until combined. Fold in optional chocolate chips, walnuts or raisins. Pour the batter into your greased baker. Top with sliced bananas (as shown) if desired. Bake for 30 to 33 minutes, or until a toothpick inserted into the center comes out clean. Place the cake pan on a cooling rack and let the cake cool completely before enjoying. I recently made the switch from metal to all glass/ceramic bakeware, and I couldn’t be happier. Here’s an 8 x 8 square baker in case you are in need of a switch, too! My go-to spray of choice for baking, roasting, etc. is always Chosen Foods Avocado Oil Spray. Don’t fear the fat! Full fat coconut milk makes this nice and moist. Since you’ll have some left over, why not try this muffin recipe, too? Have a hankering for adding a punch of chocolate to this cake? My favorite is Enjoy Life Chocolate Chips. And who can forget the purpose of this post … banana flour! 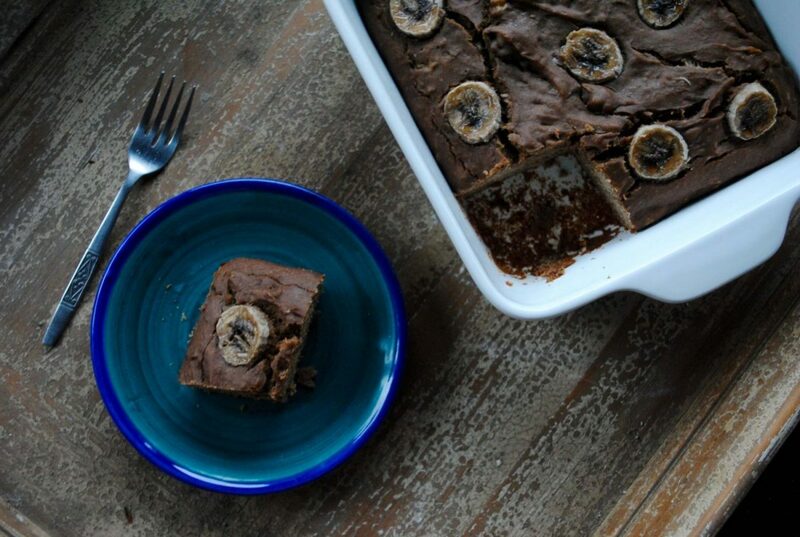 Not quite ready to take the plunge with banana flour? It’s said that you can swap it out with whole-wheat or white whole-wheat flour. If you try it this way, please share your results in the comments below. But I hope you are inspired to try out banana flour. Look for more recipes using it soon! This was such a good gluten free recipe! I made chocolate banana flour cake. To say it was absolutely delicious would be an understatement. Ooh – I love the idea of adding chocolate! Can I use flax egg or applesauce instead of egg? I have not tried it, but would love to hear how it turns out. I am sure it will work; it may not be quite as fluffy, but I imagine that the applesauce would keep it nice and moist. This didn’t work at all. Very , very dry. Maybe my bananas were smaller? It would be good to have measured amount of mashed banana,to ensure this is a moist bread. I’m so sorry to hear this. I do take all comments seriously and aim for my recipes to be winners! I remade the cake (again) after receiving your message and measured the bananas – 1 cup mashed (I updated the recipe, too). I also did try adding 2 additional TBSP of coconut oil (updated in recipe, too). You are correct; the banana flour can be somewhat dry, but this helped moisten it a little more. And fwiw, I added some mini chocolate chips to the batter and sprinkled a few on top which were a really nice touch. If you have some more banana flour left, perhaps you’ll try again. Thank you for taking the time to try it and comment! Really good! Thank you! I have been experimenting with baking without traditional flours and this is awesome. I tried it once with butterscotch chips. So good. I love it! Thanks so much for trying and commenting. And those butterscotch chips sound amazing – need to try! Have you tried this recipe with a different binder than eggs? Like Egg-Replacer? It seems as though there are several options that are alternative to eggs, if you’re already going dairy free. 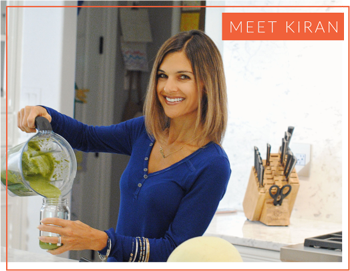 See the comment below this one – she made a chia seed egg replacer with success. Let us know if you try it! hi thanks for the recipe. i substituted egg for 3 tablespoons chia seed and 3 tablespoons water (let sit for 5 mins together in a bowl) and monk fruit powder for maple syrup. it turned out delicious and is a great vegan alternative! my boyfriend thought the texture and taste were great too. success!